To start at the very beginning, you can actually attribute the origins of the word “trivia” to the ancient Romans; “tri” as we know refers to “three” and “via” is another term for “road.” Therefore, trivia technically means “A meeting place of three roads.” During Roman times, this meeting would often occur in a tavern of sorts or would be a place of “ill repute”, as well the word tavern also denoted a meaning of unimportance; thus, eventually giving way to the term, “trivium” which is clearly the origin of the modern term, “trivial”. The first documented use of the word “trivium” was recorded in the mid-1400s, and it referred to bits of insignificant information that would only appeal to the interests of students. Today, the term “trivia” pretty much represents the same meaning but has taken on its own sense of importance and earned a permanent place in culture. By 1966, the first book ever to contain a comprehensive pile of trivia was published and co-written by authors, Goodard and Carlinksy. 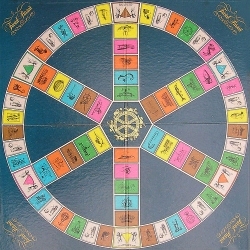 Over a decade later, the timeless game of Trivial Pursuit found its way to the public’s consciousness via authors Chris Haney and Scott Abbott. The two formed the game while attempting to play a game of scrabble, but to no avail since a few pieces were missing. In a burst of sudden inspiration, the two quickly developed a replacement game, which ended up being the game we’ve all grown to love.